In 1985, Northwest Natural Products® redefined the dietary supplement industry with the introduction of tasty and natural gummy-based vitamins. Today, Northwest Natural Products is a leader in the field of taste and nutritional technology it pioneered. With over 142 items that cover the full spectrum of dietary supplements for children and adults, they offer innovative delivery systems to facilitate absorption and make vitamins palatable to a wide audience. Their brands include L'il Critters, Vitafusion, Vitafusion Fiber, and AccuFlora. At a time when health is on everyone's mind, NNP, the leader in vitamins and supplements, is working to protect your health and the health of our planet. All of the plastic bottles from Northwest Natural Products are BPA free. The company places the upmost importance on strict nutritional accuracy and the highest product quality with stringent testing. 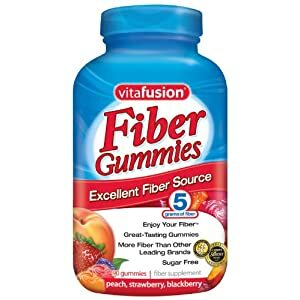 I received a bottle of Vitafusion Fiber Gummies for review. I'm certain that I don't get the recommended daily intake of fiber so these are contributive so reaching that level. The 90-count bottle contains gummies that are sugar-free in the flavors of peach, strawberry, and blackberry. By taking the recommended dosage of two gummies per serving, you are receiving five grams of soluble fiber. I won't bore you or give you horror stories about my digestive system but I will say that I'm "irregular". Taking these fiber gummies helps me to have more regular movements. The gummies have a good texture and nice, fruity flavors. They are easy to chew. I've noticed that heat sources cause the gummies to stick together, so it's best to keep them at room temperature away from sun and heat. These fiber gummies sure beat having to chew chalky tablets or drink a gritty powder mix. One person will win a bottle of Vitafusion Fiber Gummies. Leave a comment with a product you'd like to try from Northwest Natural Products. "Like" Vitafusion Fiber Gummies on Facebook. Follow Vitafusion on Twitter, vitafusion. Leave a separate comment for each entry and include your email address in the comments. Giveaway is open to residents of the USA. Giveaway ends 7/27/11 at 8 pm CST. Winner will be randomly drawn and will have 48 hrs. to respond to email notification or a new winner will be drawn. I received product for review from Northwest Natural Products. The opinions within this post are of my own and I was not influenced in any way. Please do your own research before purchasing products. Your opinions and results may differ. I'd like their Vitafusion Calcium. I think the multivites and accuflora would be great for me to try out. I would like to try the Lil critters omega-3 gummy fish! I like VitaFusion fiber gummies on facebook! I "Like" Vitafusion Fiber Gummies on Facebook. I'd like to try the Vitafusion Daily Immune gummies. I would like to try the Adult Fiber Gummies. I'd like to try the multi vitamins. I'd like to try their Vitafusion Multivites! I would like the Vitafusion Energy B-12. I'd like to try the L'il Critters Gummy Vites for my son. I subscribe by email. Entry #1. I subscribe by email. Entry #2. I would like to try their daily immune viatmins. I would like to try the ACCUFLORA. I would like to try the Fiber Gummies Weight Management too.